Half Sick Of Shadows was published after winning (jointly, with Michael no-relation Logan's Apocalypse Cow) Terry Pratchett's 'Anywhere But Here, Anywhen But Now' speculative fiction prize for debut authors. This makes me wonder, perhaps a little uncharitably, if the author had to hurry to finish his manuscript before the submission deadline for the competition, because - although there are many positive things to say about this novel - my main criticism of it is that to me, it reads rather like a first draft, particularly towards its conclusion. When I bought this book, I didn't know it had won the prize in question, and therefore I wasn't expecting a whimsical Pratchettesque romp - I mention this because some reviews I've seen on sites like Goodreads and Amazon have suggested this was probably the case for a lot of people who have consequently been disappointed, as this book is most emphatically not that sort of novel. I suspect this expectation has been the cause of some unfairly harsh reviews from readers. Narrated primarily by Edward Pike (although there are some short sections of third-person omniscient narration - more about that later), it opens with a dysfunctional family living in the Manse, a rundown, isolated house in what appears to be somewhere at least similar to rural Ireland, burying their rather repellent grandmother. At around the same time, the young Edward meets a gentleman in a Morris Minor who claims to be a time traveller and Sophia, his twin sister, promises their bullying father that she will never leave the Manse. It soon becomes clear that Sophia's promise is far more significant than it might have appeared, and as the story unfolds, the consequences for Sophia are grimly serious. Fast-forward a few years and Edward is sent to boarding school - presumably a state boarding school for children who live in extremely isolated locations, as the Pikes are clearly living in considerable poverty - where he meets Alf Lord, a boy with a particular liking for poetry and an odd tendency to disappear. While Half Sick Of Shadows is far from riotously comical, it is very funny at times in a dark, League Of Gentlemen sort of way. Edward himself, frequently described by others as 'precocious' and academically gifted beyond his peers, is also hopelessly naive and at times his inability to read social situations or grasp certain nuances of language seems suggestive of a condition akin to Asperger's Syndrome. The tragicomic matter-of-factness with which he relates the casual cruelties and constant hardships of his childhood makes him impossible to dislike and lends a degree of warmth to the book which might otherwise be missing. 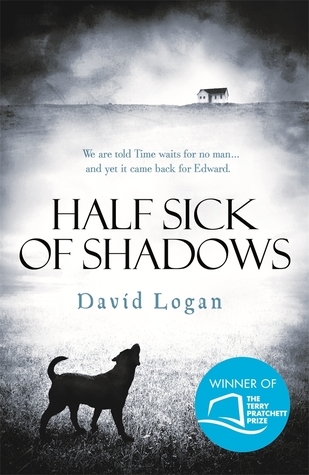 However, at times Half Sick Of Shadows is genuinely bleak and borders on disturbing: we can laugh guiltily at the almost Lemony Snicket-like horrors of Edward's boarding school years and the black farce of some of the goings-on at the Manse, but the story of Sophia, trapped with two older brothers (one an aggressive bully, the other with serious learning difficulties) and her ailing parents (one of which is an obvious abuser) and denied any sort of education or social life, is a different matter. This isn't a negative as far as I'm concerned, but some readers might find it so. You may have noticed I mentioned a time traveller appearing at the beginning of the review, and a mysterious disappearing boy, yet my review then seems to become a critique of a book with no spec-fic elements whatsoever. That's because while those elements are, in fact, present in the novel, but for the most part are heavily played down until the book is close to its conclusion. As the story progresses we learn more about Alf, and it becomes obvious that there is a reason why nobody in Edward's world has heard of Tennyson, and why some things about the novel's setting seem slightly out of kilter with what we think of as reality. Half Sick Of Shadows is an odd book, at times baffling, and there is no spoon-feeding whatsoever from the author. For example, the frequent parallels and allusions with Tennyson's poem 'The Lady Of Shalott', a line from which gives the book its title, are significant to the extent that if you're not familiar with it, as I fortunately was, you'll miss out on a large part of what Half Sick Of Shadows is about (or at least what I interpreted it to be about). I enjoyed a great deal of this book, and I certainly don't feel my time was wasted by reading it, but I do think it was lacking something, and it's this that made me wonder if the author rushed to finish it. On a technical level, there are some devices which I had an inkling were desperation passed off as style: the occasional jarring switch into third-person omniscient narration, for example, and a few pages near the end in which conversations are related in a sort of script format. I have no problem with switches in style if they add something to the book, but these felt suspiciously like the author realising too late that his plot relied on Edward not being present at essential moments and having to find a way around this, or that he needed some very 'talky' passages to explain some difficult concepts and didn't really have a better way of relating them. I also felt, as I read the final quarter of the book, that either the ending needed to be less rushed or the middle section about Edward's schooldays needed to be shorter. At it is, the structure seems to lack balance. Much of Half Sick Of Shadows is excellent, full of fascinating concepts, well-executed characterisation and pitch-perfect prose - but ultimately it just didn't feel quite complete to me, as if it were missing some revisions and a final polish. 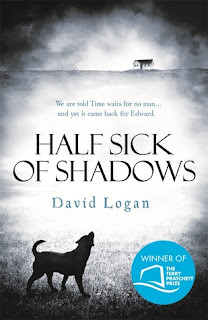 I'll look out for more from David Logan, though, as I felt there was so much potential in Half Sick Of Shadows, and I'd like to see what he produces next.